Zac Efron wears black high top Converse “Chuck Taylor” All Stars in the film. The main cast of players for High School Musical 3 take their bows. It’s half time at the state championship basketball game and the East High School Wildcats are down by double digits. How are they going to regain their cool and try to make at least a respectable showing for the second half? Not by an impassioned speech by the coach, or someone’s brilliant X and O analysis of how to break down their opponent’s defense. This is High School Musical after all. The way that you rally the team is with an incredible song and dance number entitled “Now or Never.” The number gets everyone in the East High crowd involved along with the cheerleaders and of course the team who then proceeds to make an amazing comeback and win at the last minute with a clever pass to a team unknown who is standing under the basket completely unguarded. Extravagantly staged numbers like this are one of the differences between the third film in the series and the first two that didn’t receive theatrical releases. Troy and Gabriella share a romantic interlude “Right Here, Right Now” in a tree house after the big game. The film brings back all the main characters from before and many of the same situations are reprised one more time. We have Troy Bolton (Zac Efron), the coach’s son and the undisputed leader of the basketball team, but who is torn between athletics and his interest in theater. We have Gabriella Montez (Vanessa Hudgens), Troy’s very bright girl friend who worries about having to say goodbye to him forever when she goes on to college. There is Sharpay Evans (Ashley Tisdale), who believes that the world is her stage, is always angling for a way to be on it, and schemes against anyone who might get in her way. In this film, Sharpay has an equally ambitious rival Tiara Gold (Jemma McKenzie-Brown), a British exchange student who starts out as her understudy. Ryan Evans (Lucas Grabeel) returns as Sharpay’s brother who now is no longer under Sharpay’s thumb and is pursuing his dream of becoming a choreographer. Chad Danforth (Corbin Bleu) returns as Troy’s best friend and teammate along with his girl friend Taylor McKessie (Monique Coleman). Rounding out the cast of main returning characters are student pianist and composer Kelsi Nielsen (Olesya Rulin), drama teacher Ms. Darbus (Alyson Reed), and Troy’s father Coach Jack Bolton (Bart Johnson). After leading the basketball team to victory in the state championship game, Troy is big man on campus. As with most musicals, the story line is just a gimmick to stage song and dance numbers. High School Musical 3 has quite a series of extravagantly produced big numbers. At the victory party after the basketball game, Troy and Gabriella renew their love for each other in a romantic interlude staged in a tree house. At school, Sharpay and Ryan sing and dance about their desire to become big name performers on the stage. Again the big budget pays off here, transforming a high school cafeteria into a hot night club cabaret, in a number entitled “I Want It All”. The buzz at East High School then moves on to the prom. “A Night To Remember” is the next big production number which goes over all of the things that one must do to get ready for the big night. Ms. Darbus’ drama class starts to plan and rehearse for the spring musical. The drama class starts to prepare for the spring musical. With the basketball championship in hand, and school cruising toward the end of the school year and graduation, Troy is the big man on campus. It is inevitable that someone is going to try to pick up on this and take advantage, and the new posers on campus are Jimmie Zara (Matt Prokop) and Donny Dion (Justin Martin) who perhaps are being groomed to take over the spots held by Zac Efron and Corbin Bleu. Troy and Chad are on to Jimmie and Donny (who become their understudies in the musical production), and decide to give them a true initiation. While they are in the showers in the boys’ locker room, Troy and Chad grab their clothes, so Jimmie and Donny have to chase them all through campus dressed only in a bath towel. This part of the film has two of the best dance numbers in the film, a rooftop dance ironically titled “Learning How To Dance” by Troy and Gabriella that really brings home the point that these kids have taken on the mantle left by the big stars of the MGM era. If Zac Efron isn’t a modern day Gene Kelly with his dancing skills, charismatic stage presence, and effortless looking hard work, then who is? Director Kenny Ortega even brings home the point by have the sequence end in a rain storm. That is followed by another tour de force, a junkyard dance sequence with Troy and Chad staged in an auto wrecking yard called “The Boys Are Back.” There are some very impressive jumps and falls in the choreography. In a way, it’s a throwaway number. The whole reason that the two boys are there is to find a radiator cap for Troy’s beat up old pickup truck, but this ends up being one of the best numbers in the show. Efron is great as always, and Corbin Bleu is right there with him. Clearly he has developed from just being a sidekick to someone worthy of his own starring role. Troy and Gabriella are together now, but what does the future bring? As with all romantic musicals, heartbreak eventually enters the picture, and the relationship between Troy and Gabriella is put through the test. One day Sharpay triumphantly stops by Troy’s locker with a computer printout announcing that Gabriella has been accepted into a special Stanford Honors Program. That night Troy brings over a romantic supper of pizza and chocolate covered strawberries and asks her what is going on. “Why didn’t I hear about this from you?” Troy asks. Gabriella replies that it was too upsetting for her to tell him. The program doesn’t start next fall, it starts next week. She will be gone and not be with Troy for the prom, the spring musical, or even graduation. 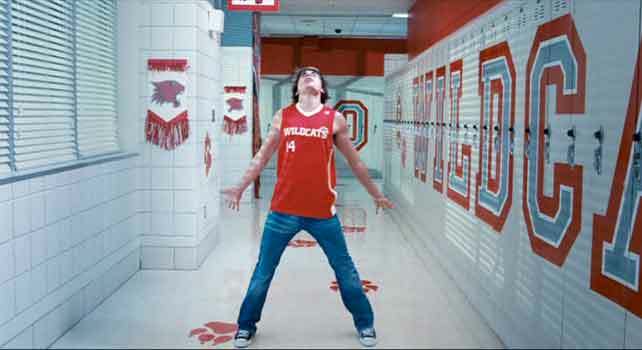 All of a sudden Gabriella is gone, and there is a big void in Troy’s life. But the show must go on, at least as far as the spring musical is concerned, and there is much comedic jockeying around as Ms. Darbus works to rebalance and recast the show. Troy and Chad do an incredible dance sequence at an auto junkyard. Troy now has some serious decisions to make for himself. Will he go to the University of Albuquerque with Chad and play on their basketball team like they had originally planned and his father wants him to do. Or will he go to Julliard School in New York to pursue his dream of a career in the theater like Ms. Darbus is encouraging him to do? Or will he go to the Bay Area in Northern California to be close by Gabriella? In “Scream”, an impressively staged torch ballad and dance in the halls and stages of East High School, Troy agonizes over what choice to make in his life. The technical aspect of this sequence alone is impressive as Efron climbs up rotating walls, shimmies through the halls in a storm, cavorts through the gym, and dances on the curtain ballasts on the school stage. How will he resolve his dilemma? Don’t worry, this is Hollywood and a musical, so you know that things will inevitably work out for a happy ending. Troy agonizes over what career to pursue and what university to attend. Despite all of its flaws and clichés as a story, High School Musical 3 is very well put together as a staged musical. Much of the credit has to go to director Kenny Ortega who has directed all of the films, and worked to make the music and dance as exciting as it can be on film. The camera work and sound is very good also. The musical numbers are well written and orchestrated. Everything in the production is very professionally done. Clearly these people and their Disney sponsors knew what would appeal to their target market, given the overwhelming response of the so-called ’tween generation to this series. But even the more jaded adults who see it eventually get caught up in the show, because the production values are so good. No matter what you think of the story line you are eventually won over by the enthusiasm and hard work of Zac Efron, Ashley Tisdale, Lucas Grabeel (the Fred Astaire to Efron’s Gene Kelly), and Corbin Bleu and the other cast members. Even Vanessa Hudgens, who seems the weakest of the cast members in terms of musical and acting skills, has an appealing vulnerability. She has a wonderful chemistry with Zac Efron in these films, and that is one of the intangible elements that makes these films successful. This is a film about graduation, and certainly Zac Efron has earned that, not only in the story line but from this series. He has demonstrated that he can command the screen in a leading role. Throughout these films he has built up a huge following in the ’tween generation and the respect of a lot of their parents. He is ready for some A list roles. High School Musical 3 has been his very impressive audition and now it’s time for Mr. Efron to take on new challenges in other acting roles and genres. Troy and Gabriella have their own personal prom night at Stanford. Troy and Gabriella sing and dance in a rooftop garden. 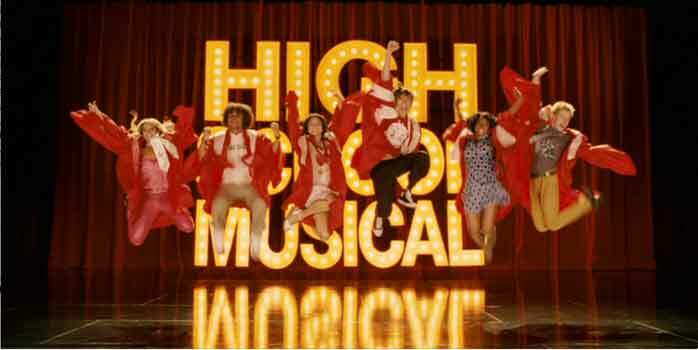 With the High School Musical phenomenon being so successful in the ’tween and teen market, our one question was, “Where are the chucks?” High School Musical 3 makes up for that missing element in great style. Zac Efron in his lead role as Troy Bolton wears black high tops in almost every scene in the film, including things like his graduation, his prom scene with Gabriella, the spring musical, all the major dance numbers, and on campus. It’s a great look for him and it reminds you how fashion appropriate chucks can be for any occasion, especially when you are young and in love. The cinematography shows a number of close-ups of Troy’s footwork in several of the dance sequences. The dance sequences are very pleasant to watch, and the camera work occasionally provides close-ups of Efron’s footwork in all of the main dance numbers. 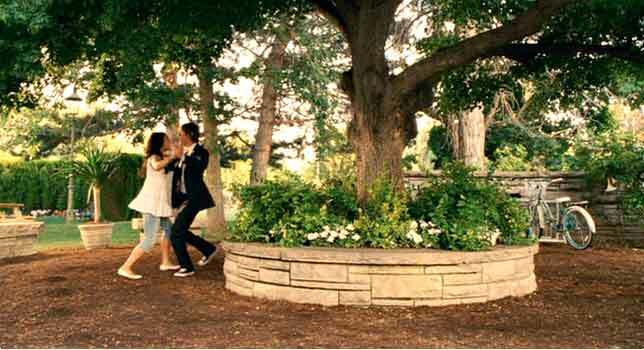 Probably the best one is the rooftop garden sequence where Troy and Gabriella imagine what it will be like at the prom. Troy puts on a formal jacket and the couple sings and performs a well choreographed number that really reminds you of the old MGM musicals, complete with a cloudburst at the end. In a tribute to Gene Kelly, Troy and Gabriella are singing in the rain. High School Musical 3: Senior Year. (2008) Zac Efron, Vanessa Hudgens, Ashley Tisdale, Lucas Grabeel, Corbin Bleu, Monique Coleman, Olesya Rulin, Chris Warren Jr., Ryne Sanborn, KayCee Stroh, Bart Johnson. Directed by Kenny Ortega. Categories: Drama, Musical.